Event Description : THEATRE : The Great Indian Storytellers presents "InHerShoes: A Journey Within" Hindi Play. 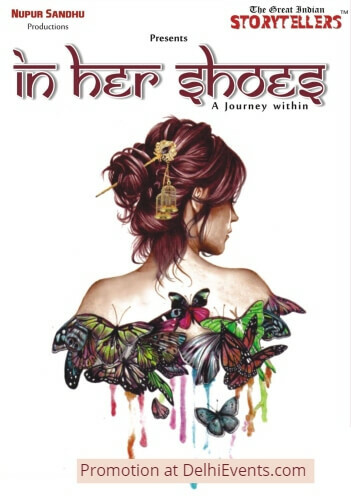 Synopsis: In her shoes is a stage play reflecting our inner deep-rooted conflicts, that we don't address and keep putting those troubling emotions under different carpets. The Protagonist of the play is a girl in her late 20's dealing with her fears related to body shaming. Her blame on others for her own situations further pull her into the cocoon of self-rejection, blame, jealousy and many such emotions. These emotions further lead to her having low self-esteem, and not getting along well with her father and sibling. She feels trapped in her own web. In her shoes shows how meeting a Serenity Surrender Therapist.... Helps her to sail thru her demons. The story of the play is inspired by the true case studies and written by Nupur Sandhu, Serenity Surrender Therapist.